China’s first aircraft carrier is finally getting an official name. Blogger Andrew S. Erickson, an expert in Chinese naval affairs, is reporting that an official state media outlet has stated that the ship’s name will be Liaoning, in honor of the province where the ship was recently re-built. The ship’s name has been the source of much speculation with it often being referred to as Shi Lang in Western news reports. While many might scoff at the hubbub surrounding the naming of the carrier, its name will carry some significance regarding Chinese attitudes towards other countries in the region. Shi Lang was a Qing general who subdued Taiwan through a seaborne invasion and the naming of the ship after him would have had sinister overtones for Chinese-Taiwanese relations. Another name choice reportedly debated within government circles was Diaoyu Dao which is an island group controlled by Japan, but disputed by both China and Taiwan. Either of those names would have indicated a bellicose attitude towards Japan and/or Taiwan. Liaoning was originally launched as the Varyag in 1988 by the Soviet Union and remained unfinished at the time of the collapse of the Soviet Union. 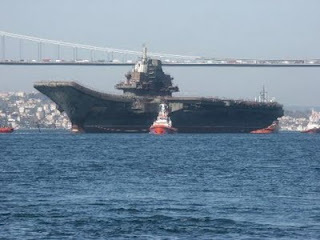 China purchased the Varyag from the Ukraine in 1998 and the ship sat derelict for several years until the decision was made to rebuild the carrier to fulfill its original role. Re-building of the ship was completed earlier last year and she has undergone multiple sea trials since. Naval experts have differed as to whether China intends to use the carrier for belligerent purposes or merely as a training vessel. It takes years to hone the skills necessary to effectively conduct the air-sea ballet that is carrier operations and it is most likely that the Liaoning will serve merely to train the crew and officers of the follow-on carriers China intends to build. The Chinese have even built a mock-up of the ship on dry land to get a head-start on training its newest generation of naval aviators.